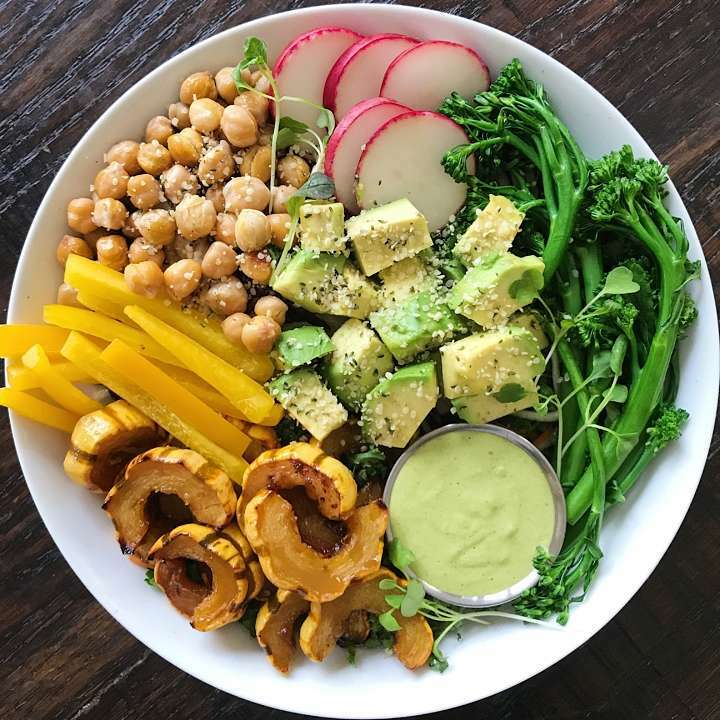 Welcoming March with a mix of Winter and Spring Vegetables served with a Green Goddess Tahini Dipping Sauce that is out of this world! First the sauce… Recipe adapted from VegNews, it’s simply tahini blended with lime juice, parsley, scallions, garlic, salt and lime zest. It’s creamy, fresh, garlicky and soooo yummy! I’ve made it several times — both following the directions exactly and with small adjustments (a little less garlic, a handful of cilantro) and I could literally enjoy it by the spoonful! It’s great with salad, slaw or veggies. Served here with Maple Glazed Roasted Delicata Squash, Roasted Chickpeas, flash boiled Broccolini and fresh radishes, yellow pepper and avocado topped with hemp seeds all on a bed of kale slaw from Whole Foods. A delicious and satisfying start to the month. This Green Goddess Tahini Sauce is a creamy, fresh, garlicky and really yummy pairing to a mix of roasted and fresh vegetables. Sauce recipe adapted from Veg News. Preheat oven to 400 degrees and place parchment paper on a baking sheet. Toss with 1 tablespoon olive oil and maple syrup to taste. Place squash in a single layer on baking sheet and roast squash for approx 30-40 minutes, until softened and caramelized. Preheat oven to 400 degrees and place parchment paper on baking sheet. Toss chickpeas in 1 tablespoon olive oil. Place in a single layer on a baking sheet. Sprinkle with kosher salt. Bake 10-20 minutes depending on how crispy you want them. For this bowl, I baked for only 10 minutes. Store any extra chickpeas on a sealed container in refrigerator for 2-3 days. Fill a medium saucepan with water and bring to a boil. Place broccolini in boiling water. Boil 1-3 minutes until tender-crisp and broccolini turns a vibrant green. (Boil longer for softer vegetables) Remove from water and set aside. Place greens in a bowl, top with roasted and fresh vegetables and serve with dressing. Enjoy!